The explosion in wireless and mobile broadband has given people far more choice about where they use their broadband connections. However, if you take out a mobile broadband contract the likelihood is that you won't get any choice over the type of modem you get. Sierra has filled the gap with an unbranded USB modem which it's aiming at those who want more from their mobile broadband than the standard USB modem provided by their carrier can offer. The Compass 855 comes in quite a chunky USB stick, which is much thicker than the Huawei E160 model which is supplied with Virgin Mobile and Orange mobile broadband contracts. This might cause problems if you're struggling for USB real estate on your machine, but most laptops will be fine. Unlike the Huawei, the Compass 855 supports HSPA connections up to 7.2Mbps (as long as your connection allows this), so those people looking to unlock the very fastest speeds will find the upgrade worthwhile. Installing the SIM card is simple, and it just clicks into place above the USB plug, and you press again to release it. There's also room for a MicroSD card in there too, which means that your connection can also double as flash storage. Like most USB modems, the installation software is held on the stick, so it's simply a case of plugging in, running the set up and you're good to go. 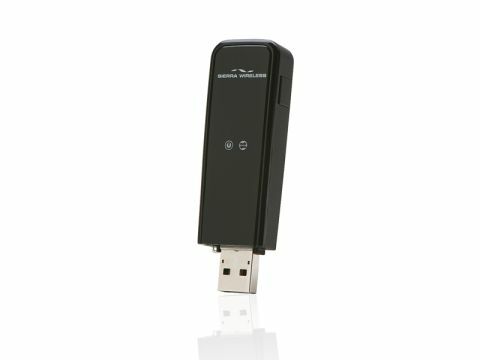 After testing the Sierra Compass 855 on the move, it was noticeable how stable the connection was when compared with other USB modems. With most mobile broadband connections you find that the connection can often disappear and pages require reloading. With the Compass 855 we were able to stream from Spotify while loading web pages without any issues. The software is extremely unobtrusive and the console consists of a tiny window, with a connect button and a reading of the data used in your current session. However, one major disappointment in the Compass 855 was the lack of information in the software. For a dedicated product we were looking for some detailed information on the connection, such as data usage amounts so one can track how much data has been used in the billing month to avoid nasty surprises. The level of data was woefully inadequate on the Compass 855's software and there wasn't even a display on your current MB/s connection speed. If you're a serious mobile broadband user then the £150 for the Compass 855 will let you access the top speeds, but for the average person there's not enough benefit here to break from the standard USB modem.